One of the most innovative breakthroughs in jet fighter technology in recent years are thrust vectoring vanes to allow high angle maneuvers. Aviation Week reported that dogfights were performed by F/A-18 pilots of equal ability during 1996. The F/A-18 HARV with thrust vectors won 30 of 33 engagements. 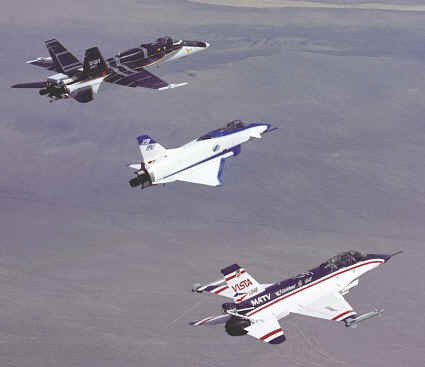 NASA conducted extensive research and testing in the 1990s on three aircraft modified with thrust vectors: the F/A-18 "HARV," the European X-31, and the F-16 "MATV" (below). Thrust vectoring also allows short take-offs and landings. Tests were deemed successful and ended. 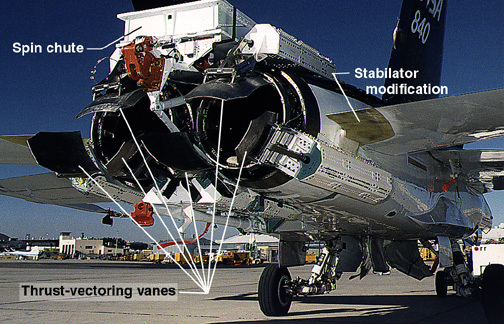 As a result, experts expected the new F/A-18Es and F-35s to include thrust vectoring vanes. For some reason, this technology has only appeared in the F-22. One explanation is that Boeing was selling its expensive F-22 as the world's greatest fighter because of its unmatched maneuverability. If Boeing includes low-cost thrust vectoring vanes on the F/A-18E, the F-22 loses that superiority claim. Bob Peters at Aviation Week thinks they make carrier landings too easy for F/A-18Es, so crazed carrier pilots dislike them. A 5-27-02 article in Aviation Week describes simulated combat between F-15Cs and Russian Su-30MK fighters, which have thrust vectoring. They learned this newer Russian fighter now exported the China and India can nearly stop in mid-air, getting into the "clutter notch" of the F-15C's advanced Doppler radar, which detects moving objects. This disrupts radar tracking for missile guidance. The article noted the maneuver is tricky and the F-15C is still a superior fighter. All new fighters should have thrust vectors, even existing aircraft can be refitted at a low price.